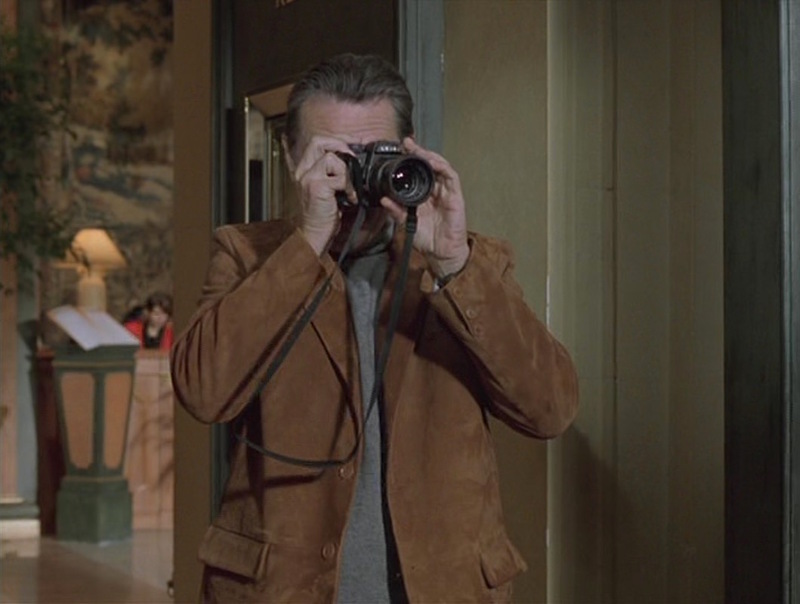 Rather than bothering with spy cameras and tactics, Sam merely brings Deirdre and his Leica R6 2 camera to the luxurious Hôtel Barrière Le Majestic (actually located in Cannes), posing as a pair of tourists and thus not raising any suspicions as they take a considerable amount of photos to prepare for the job.What’d He Wear? Sam wisely dresses for his reconnaissance mission with Deirdre, sticking to a relatively neutral two-color palette that helps him blend in among the tourists while still choosing luxurious items in interesting fabrics that allow him to fit into the elegant surroundings of a deluxe hotel in the French Riviera. When he’s on the job and ready for action, Sam is typically outfitted in a rugged leather jacket, but he chooses here the softer napped reverse side. Sam’s single-breasted sport jacket is made from tobacco brown suede with notch lapels. Sam goes full tourist with his Côte d’Azur guidebook. The jacket has a seam around the waist, in line with the second button and the top of the straight flapped hip pockets. The jacket also has a horizontal shoulder yoke across the back, a welted breast pocket, padded shoulders, and a single back vent. The sleeves are a touch too long with three well-spaced vestigal buttons that extend to the very end of each cuff. Like the two buttons on the front of the jacket, these three buttons are light brown plastic four-hole sew-through buttons. 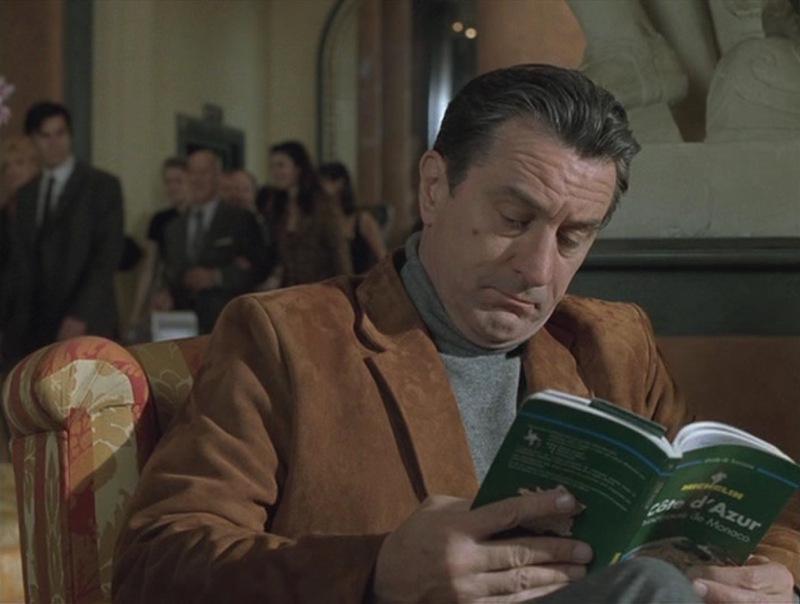 Robert De Niro, making tourism cool again. 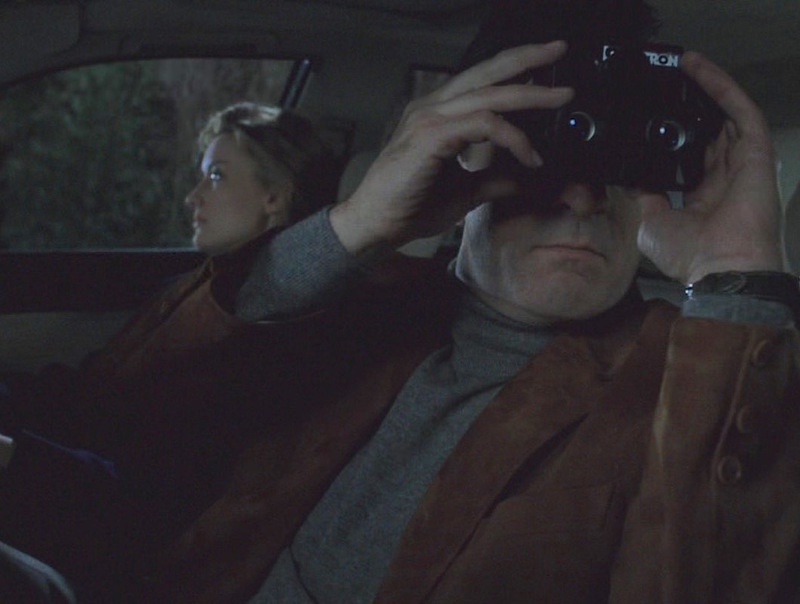 Turtleneck sweaters are a De Niro favorite in Ronin, from the charcoal merino turtleneck worn earlier with a heavy black wool coat to the maroon turtleneck he would wear for the film’s climactic action sequence. 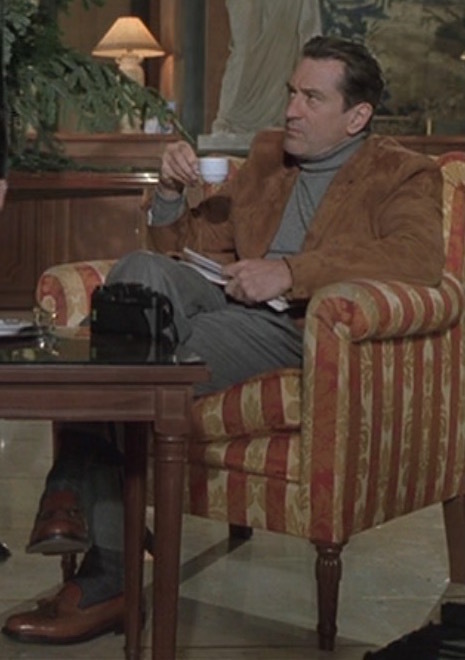 In this scene, he wears a gray cashmere turtleneck sweater with thin ribbing on the neck, cuffs, and waistband. The material was confirmed by cashmere by the listing of this particular item, documented as #CP2540 in the Harry Ransom Center archives at the University of Texas-Austin. Sam echoes his established gray and light brown palette from the waist down with a pair of gray wool reverse-pleated trousers with plain-hemmed bottoms. 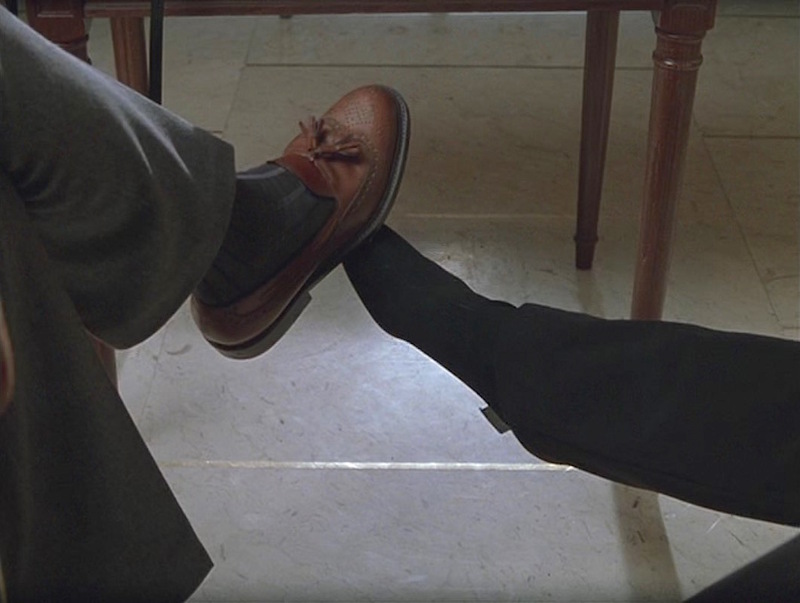 They are likely worn with a belt – and my best guess would be a brown leather one – but the ribbed waistband of the turtleneck covers De Niro’s waistline throughout the sequence. Sam wears a pair of chestnut tan leather tassel loafers with perforated medallion wingtips, similar to the classic Allen Edmonds “Manchester” slip-ons. Sam’s socks are dark gray ribbed cotton lisle, coordinating with the lighter shade of gray in the trousers to appropriately continue the leg line into his shoes. Sam’s wristwatch has been identified as a vintage Jardur chronograph by The Watch Spot, a site dedicated to the restoration and repair of classic watches. 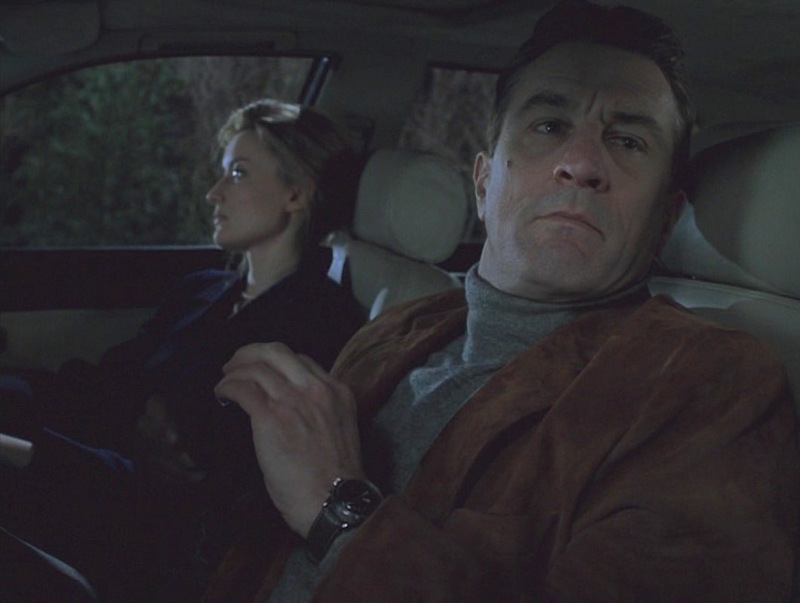 The Watch Spot identified De Niro’s watch as the earliest Jardur Bezelmeter model, a Bezelmeter 950, “recognizable by the oval pushers and cathedral hands.” The watch has a stainless case, black dial, and is worn on a black leather strap with off-white stitched edges. According to The Watch Spot, the watch was sourced from a Parisian watch dealer when production began in France. De Niro supposedly liked his character’s vintage Jardur so much that he kept it as a souvenir of the production. Sam needs to be low-key but luxurious for his recon mission with Deirdre, wisely eschewing some of the bolder fashions one may see in the French Riviera in favor of a neutral, limited color palette with elegant but decidedly not flashy items like a light brown suede sportcoat, gray cashmere turtleneck, and ornately detailed tassel loafers. Of course I’m afraid! You think I’m reluctant because I’m happy? The Hôtel Barrière Le Majestic is located along Boulevard de la Croisette in Cannes, France, rather than Nice as depicted in Ronin. Earlier this week, the legendary Cannes Film Festival kicked off its 71st annual event with Cate Blanchett serving as president of the jury and French actor Édouard Baer hosting. Was thinking of suggesting it to you but this just looks terribly dated in my eyes and his footwear leaves something to be desired, though they’re tassels. The all-grey outfit seems to recall Sean Connery’s magic disguise he wore under his fisherman’s clothes in You Only Live Twice. De Niro shows an interesting way to wear such an outfit, casually and it would’ve made some sense had Bond gone a similar route with a hacking jacket.